Make a lasting impression! While the world has gone digital, a good and professional business card is still one of the best tools needed to get your business noticed. The more innovative, creative and flashy your business card, the less likely it is to be dumped in the bin or tossed in the pile of forgotten business cards. 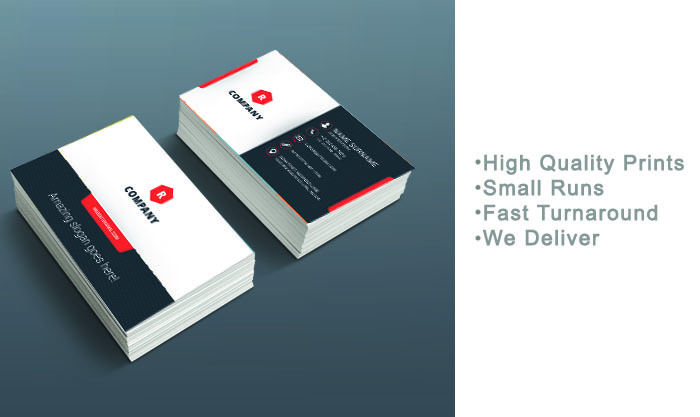 While there are many business card printing companies out there, we stand tall among them. With our superior quality printing, fast service and several printing & finishing options to choose from, you are sure to get a custom business card that will capture people’s attention and stand out from the rest. It is tough for many businesses to compete in the highly competitive business environment. That is where memorable and attention-grabbing business card comes in. Beautifully design business card grabs the attention of potential customers, creates interest and makes them remember your business. Majority of the job we do are custom, so we can handle your unique design and marketing technique. You need a unique marketing tool to stand apart from competitors in today’s business environment. Whether you want to pique the interest of potential customers or existing customers, you need a uniquely designed business card. We have a knowledgeable team that can handle your challenging and creative marketing technique. We can create a unique solution for your custom business card printing project and make the card as unique as your business. Your card is just like a mini billboard that promotes your business and you only have 3 seconds to make that lasting impression. Why not make it count? We can keep your card clean while showing who you are to the potential customers. So, you’ll be getting a decent, yet appealing and catchy business card from us. Even if you don’t have any design and you are ready to print, we have a lot of cool designs and we can even customize it for you. The best part of our service is that we deliver quickly at an affordable rate. Get your business card and effectively market your business today!